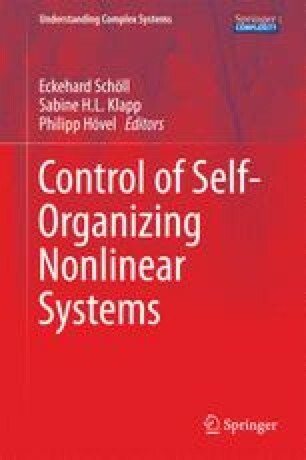 We discuss an adaptive control delay-coupled networks of Stuart-Landau oscillators, an expansion of systems close to a Hopf bifurcation. Based on the considered, automated control scheme, the speed-gradient method, the topology of a network adjusts itself by changing the link weights in a self-organized manner such that the target state is realized. We find that the emerging topology of the network is modulated by the coupling delay. If the delay time is a multiple of the system’s eigenperiod, the coupling within a cluster and to neighboring clusters is on average positive (excitatory), while the coupling to clusters with a phase lag close to \(\pi \) is negative (inhibitory). For delay times equal to odd multiples of half of the eigenperiod, we find the opposite: Nodes within one cluster and of neighboring clusters are coupled by inhibitory links, while the coupling to clusters distant in phase state is excitatory. In addition, the control scheme is able to construct networks such that they exhibit not only a given cluster state, but also oscillate with a prescribed frequency. Finally, we demonstrate the efficiency of the speed-gradient method in cases where only part of the network is accessible. This work was supported by Deutsche Forschungsgemeinschaft in the framework of SFB 910. JL acknowledges the support by the German-Russian Interdisciplinary Science Center (G-RISC) funded by the German Federal Foreign Office via the German Academic Exchange Service (DAAD). PH acknowledges support by the Federal Ministry of Education and Research (BMBF), Germany (grant no. 01GQ1001B).